These changes may also be seen on the Donations / Bank Details page. Please reflect these changes when donating to the school. Thank you so much. Haji Public School began operations on May 4th, 2009 from Village Breswana, the ancestral home of its founding members, the Haji family. The school started with two classes, lower and upper kindergarten, two teachers and 35 students studying in rooms of the Haji Cottage. Today those same students have reached Grade 10, and the school grows with them each year. 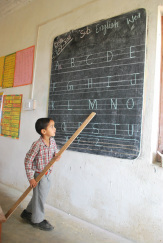 Haji Public School now has over 500 students on its rolls, a permanent local staff of more than 20 teachers, and a running roster of dozens of Indian and international teaching volunteers. The volunteers are provided free boarding and meals and live in the village for three months or more, while they teach and learn about the village, its culture and its people. Breswana is a typical Himalayan village in Doda District in Jammu and Kashmir – remote and cut off from the world below. At over 7500 feet, this is just one of many hundreds of villages with no motorable access to the rest of the state. Education in this pahari [mountain] region has languished in the past few decades. By setting up good schools in the region, the Haji family intends simply to make education accessible to the inaccessible. Haji Public School follows the Jammu and Kashmir State syllabus, it is an English-medium, privately run organisation with a heavy focus on high academic and co-curricular quality. Along with studies, we like to provide students with a fun learning experience that involves activities with music, movies, dramatics, public speaking, and sports and games in their daily school life. college in the vicinity for these students and others in the region to pursue higher education. You can view pictures and videos of the school here. More photos and videos can be found on our Facebook page, School Tumblr and Village Tumblr. Would you like to help our students?